We supply brass grommets and washers in standard and custom sizes for bespoke and everyday applications. Our brass grommets and washers are manufactured and produced to British and European standards (BS3102 and BS3226) and supplied to customers within the UK and elsewhere in the world. We work within your timescale and budget to deliver affordable, high quality brass grommets and washers, plated in a range of colours to suit various needs and uses. These include eyelets, grommets and washers for tarpaulins. 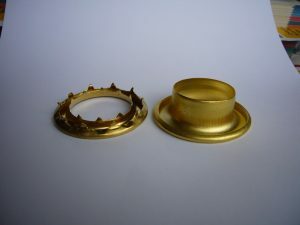 Looking for brass eyelets, grommets or washers? Get in touch today for a FREE, no-obligation quote.